The beautiful Camellia sasanqua has chosen this stretch of wet, cool grey days to burst into bloom. I was taken by surprise this morning to see the shrub by the drive beginning to show its delicate white blossoms. These spring like blossoms look almost out of place beside the falling leaves. Camellia sasanqua begins its season of bloom in autumn. It likes cool weather and appreciates a spot of protection from wind and heavy weather. When freezes come, all open blooms may turn brown, but in a few weeks, new ones generally follow. Various cultivars will come into bloom over a long season between now and early January in Zones 7-9. Several species, like C. “Yuletide” and C. “Jingelbells” are enjoyed for their red blossoms in late December. These evergreen shrubs are grown for their leaves as well as their blossoms in their native China and Japan. Extremely common in Japan, tea is made from the leaves, and oil is rendered from the seed pods. In the United States we grow them as ornamentals. 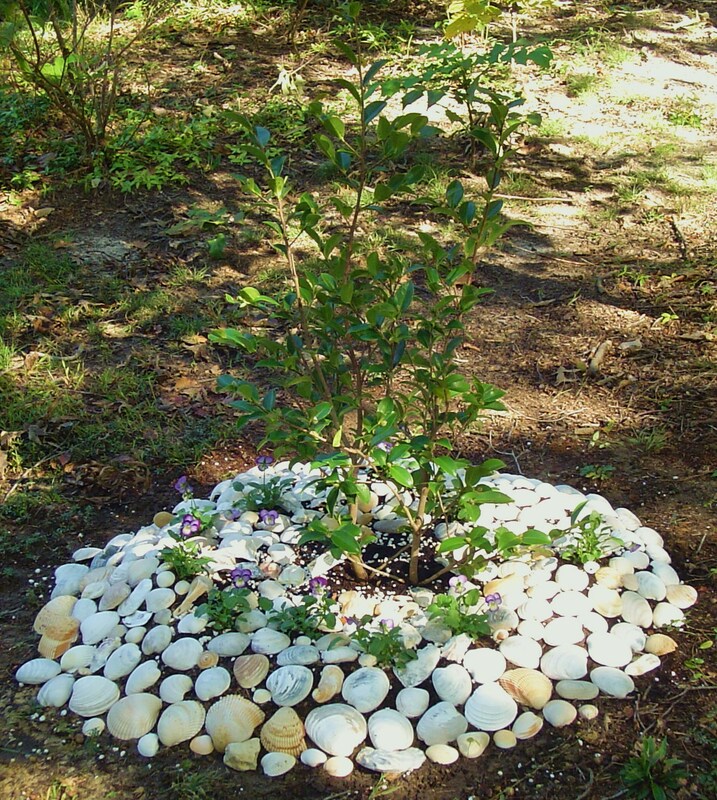 Camellia sasanqua grow to various heights from fairly small plants topping out at only 4″ to small trees, growing to 15′, depending on the cultivar. Older Camellias, limbed up to show their trunks, are especially lovely when in bloom. This is another plant where it is important to read the label carefully when selecting a cultivar. Be mindful that the plant you select will have enough room in the spot you’ve chosen. Some cultivars will also branch out into wide canopies over the years. They are much more beautiful when allowed to grow into their potential with pruning to shape, but not to stunt their growth. Our latest Camellia to bloom in early November is a lovely shade of deep pink. Camellia sasanqua have slightly smaller blossoms and leaves than the Camellia japonica. They are also more likely to have single or semi-double flowers, but all of the many Camelllia flower forms and colors are available. In addition to white and red flowers, there are many shades of pink, and some cultivars with mixed shades within the same flower. Newly planted C. “Yuletide” will bloom in this pot near the front of the house in December. It can grow on here for a year or two, and then go out into the garden in partial shade. Plant new shrubs now. They are easy to find in the garden centers, and are not particularly expensive. 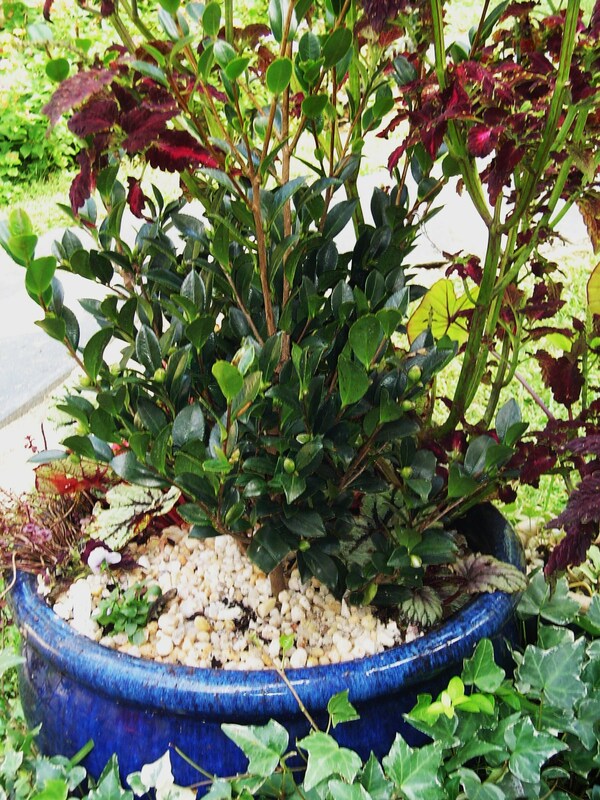 I prefer small shrubs in a small 1 gallon pot, and can generally find them for between nine and fifteen dollars, depending on the cultivar and the nursery. These shrubs prefer to be planted slightly high; an inch or two above the surrounding soil line in acidic soil. 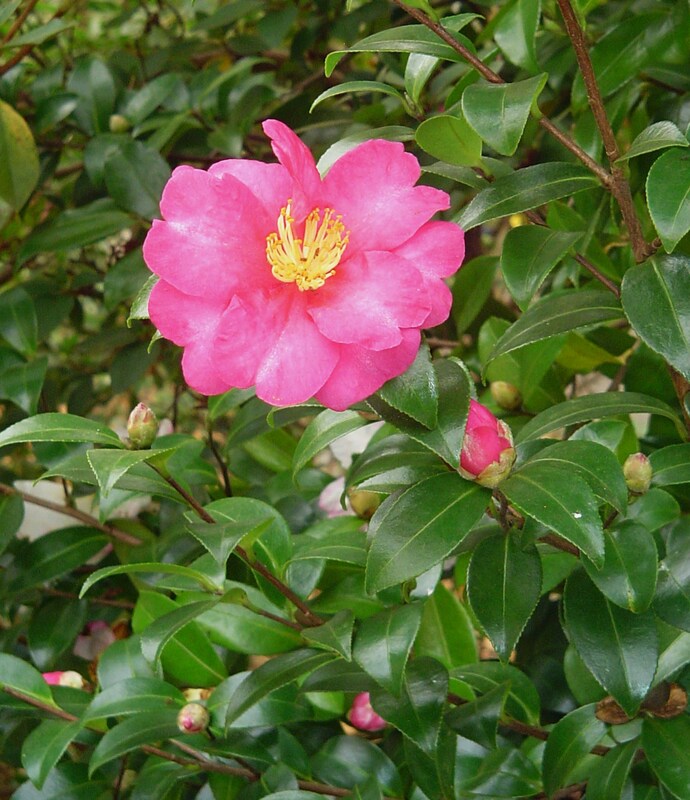 Camellias are a wonderful understory shrub, and grow especially well under pines. I plant with plenty of compost, mounding the compost around the exposed top of the root ball. Daffodils can be planted around the shrub to protect its roots from voles. I also plant Violas in the mounded compost for a lovely winter time “skirt” of protective flowers. Camellias do well in partial sun to partial shade. They can tolerate far more sun than the spring blooming Camellia japonica. Fertilize in late summer with Espona’s Holly Tone, which is an organic fertilizer formulated for acid loving shrubs. 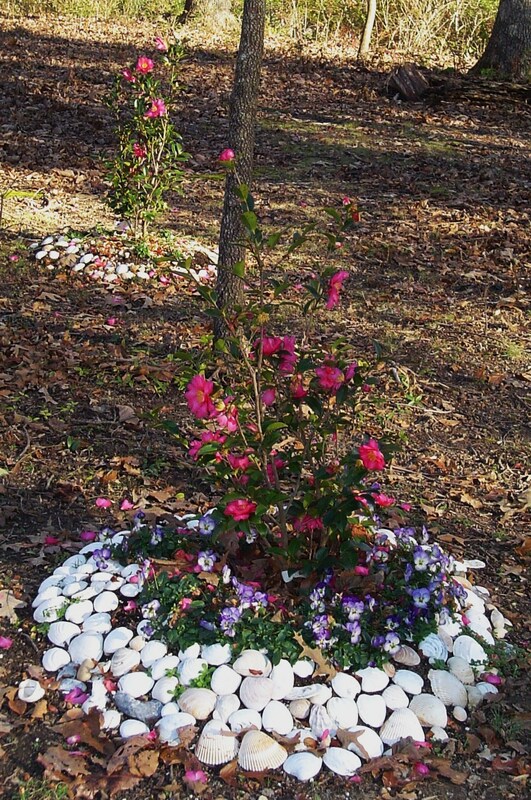 A newly planted Camellia in October of 2011 has extra protection against the squirrels from large shells over the mounded compost. Older Camellias, especially taller ones, tend to be deer resistant. Newly planted shrubs, especially when covered in buds, can become deer candy if left unprotected. We learned that the hard way during our first autumn on this property. We planted a line of Camellias along the front edge of the property, all covered in buds. Within a week the deer discovered them, ate all of the buds, and many of the leaves. The shrubs eventually set bloom again. I’ve fertilized them and mulched with compost every spring, keep them watered during dry spells, and have enjoyed seeing them recover, grow, and bloom. The high nitrogen content in shrubs fresh from the grower makes the plant taste salty to deer. Newly purchased and planted shrubs need special protection from hungry herds of deer for the first year or so in the garden. We’ve learned that applying Milorganite, also a fertilizer, helps protect tasty shrubs from grazing deer. Camellia sasanqua blooming in late December of 2011. If you enjoy 365 days of flowers in your garden, the Camellias fill an important niche. Beautiful in the landscape, and cut for the vase; Camellias are healthy, hardy, easy to grow, and a beautiful addition to a forest garden. January 29 Cotton candy describes these lovely Camellias, blooming in late December before snow found our garden. I can’t believe your Camellias are still blooming!! that’s great, i love camellias. I love my sasanqua and am trying to find a place for another one. The single flowers are so graphic and cool. The flowers don’t survive our winter wind and rain as well as the japonicas, so they need a more sheltered spot. Yes, the wind just shatters them, unfortunately, but then you get the “cherry blossom effect” on the ground around them. I hope you find a good spot. Our large ones were planted decades ago by the original owner of the garden. So beautiful. Thank you for visiting the blog, Jen. My spirea continues to put out a few new little flowers until it freezes. They’re brave little guys. Which color spirea do you have?